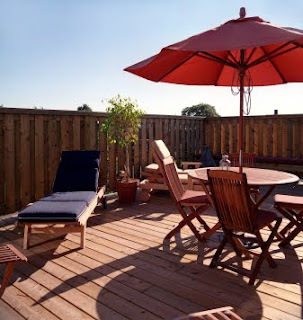 If you enjoy spending time outdoors with family and friends, patio furniture is a very wise investment. The right furniture will not only allow you to entertain in your outdoor space, but it will also enhance the visual appeal of your yard or patio. Good quality patio furniture will enhance the value your property, not to mention your quality of life. The biggest impediment to enjoying your outdoor space is the weather, so it's important to equip your yard or patio for your climate zone and seasonal weather shifts. Accessories like garden umbrellas and yard misters can stave off summer heat, while patio heaters, chimineas and outdoor fire pits ensure you can relax comfortably in the cooler months. Incorporating these useful patio products into your outdoor space will allow you to enjoy yourself year round. If you live in a climate zone where temperatures exceed 80 degrees, it is worth investing in some sort of shading. A good quality market patio umbrella will protect you and your patio furniture from prolonged exposure to direct sun, which can result in discomfort, sunburns and faded furniture. Garden umbrellas come in a variety of colors and patterns that can visually transfer your outdoor space. Power base patio umbrellas, such as the Milano Pro Offset Umbrella, are exceptionally easy to use and transport because they have a built in rotating device with foot pedal and two built in hand grips for easy lifting. These top of the line patio umbrellas will keep you cool while you enjoy your light meal or summer cocktail on the patio. If you want to spruce up your patio and extend your patio furniture usage into the night, consider purchasing the auto-tilt patio umbrella with LED lights that provide a soft night time glow. Some of the most enjoyable times to be outdoors are dawn, dusk and nighttime. Early morning coffee on the patio is perhaps one of the best ways to start the day, and nothing beats a cool winter night, wrapped in a blanket under the stars. These moments, while beautiful, can be prohibitively chilly without the right patio products. An outdoor patio heater will allow you, your family and friends to comfortably enjoy your outdoor space, even when there is snow on the ground. There are a wide variety of patio heaters available, ranging in size, composition and price. Choose from gas, electric and propane patio heaters depending on your specific needs. A high value option is the stainless steel outdoor patio heater by patio comfort. This heavy duty infrared patio heater has easy on and off tank access and adjustable heat output, so you can set it at the perfect temperature for you and your guests. Hanging patio heaters are a popular choice among restaurants and hotels. These ceiling mounted patio heaters provide significant warmth without taking up valuable patio space. Wall mounted patio heaters are also an efficient patio heater choice. The Fire Sense wall mounted infrared patio heater operates at 90% efficiency and is substantially less expensive to operate than propane patio heaters. Whichever choice you make, turn on your new patio heater and stay warm while enjoying a relaxing drink or dinner outside. Using a fire pit is another way to stay warm while spending time on your patio at night or in the cooler months. Patio fire pits provide a traditional, rustic appeal as well as warmth to your patio and come in a variety of unique designs. Fire pits offer both style and functionality and often become the focal point of the social gathering. Choose a design that reflects your personality, style or heritage. All of the high quality fire pits bring warmth during the winter months, but can be used year round for enjoyment and décor.